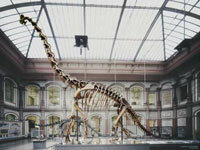 Boasting more than 30 million objects throughout its geological, paleontological and zoological collections, the Museum of Nature in Berlin is the biggest of its kind in Germany and one of the five largest in the world. Children of all ages, and adults, will enjoy discovering the extensive treasures of this incredible museum and learning while they wander around the exhibition halls, which take up a massive 71,000 square feet (6,600sq/m). Apart from the ever-popular dinosaur skeleton exhibit, highlights include sections on evolution, domestic animals, the cosmos and solar systems, minerals and much more. There are also temporary exhibitions on show - check the website for details on what is being exhibited currently. The museum is very well-organised with labels in multiple languages and audio tapes available in about 10 languages. They also organise activities and holiday schools for enquiring young minds. It is easily one of the most popular attractions if travelling in Berlin with children. It is a traditional museum but there is lots of interactive stuff to keep little ones amused. Opening times: Tuesday to Friday 9.30am to 6pm; Saturday, Sunday and public holidays 10am to 6pm. Closed Mondays. Last admission 30 minutes before the museum closes. Admission: €8 (adults); €5 (reduced); concessions available.